I’m a West Texas girl. I grew up in Ft. Worth – which is about a 6-7 hour drive from here. West Texas can be WINDY with a capital W (and capital INDY, too.) We have our usual Dirt Storms. No, not dust storms – DIRT storms. The sky turns the color of dirt – there may be road closings due to poor visibility. Power outages are a probability. 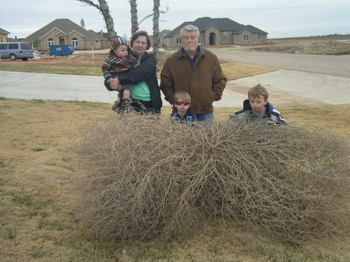 There may be tumbleweeds as large as cars flying through the air. Small children can easily, accidentally, become airborne. It can get ugly. Today was such a day. The kids stood at the window and watched as all sizes of tumbleweeds flew up the street in front of our house. When my mom is visiting, she calls them Tumbleweed Races. The kids LOVE to watch Tumbleweed Races. My favorites are the ones that fly by, about 10 feet off the ground, and they never come down to earth to bounce. Those crack me up every time. So pretty much everyone stays inside if at all possible and any outings are postponed or cancelled. No problem. But what may surprise you is that even in a very nice house, you get dirt in your teeth. Yes. Really. The air smells of dirt, it lines the windowsills, even though the windows are sealed inside and out. The wind wails, the garage door moans loudly, and the whole house creaks incessantly as if it’s about to split apart. The animals hide. The kids CANNOT take naps for pete’s sake, and anything you might have had outside (toys, pets, patio furniture – no matter how heavy) – well, it’s probably still outside, but not necessarily contained by a big fence and probably in someone else’s yard. Someone else in another county, possibly. Many years ago a friend and I (also new to the West) were at her apartment, and she was determined to grill salmon on her barbecue. I don’t know why, now that I think about it. Something went wrong, and she wanted me to go to the store and get more while she manned the grill. I remember us talking about what it meant for a "Blue Norther" to come through. All day we had heard it on the radio. Between the two of us, all we had gathered was that the temperature would drop instantly by at least 20 degrees. It was in the 70s, and a beautiful night. It didn’t seen likely. I mean, how does temperature just DROP that much, and that quickly? We couldn’t picture it. Off I went to the store for salmon. I was in there for just a couple of minutes, and when I was exiting, there was a really tall cowboy in front of me. About 8 feet in front of me. He wore Wranglers. Tight wranglers. And a hat. As he was 8 feet in front of me, he exited the grocery store and I noticed he immediately pulled his cowboy hat on a little lower. And then… he wasn’t 8 feet in front of me anymore. He wasn’t 8 inches in front of me. When I got to the exact line where the inside of the store met the outside, a gust of wind picked me up and whoooshed me 8 feet forward and plastered me against his backside. And Cowboy, being apparently From the West and all, didn’t seem all that fazed. I don’t remember apologizing, but knowing me I probably did a few thousand times. He made sure I had my feet on the ground, asked me to point out my car, and walked me there, holding my right arm with both of his in case I went flying off into the COLD night air again. he said with a serious, stern expression, "Now you go straight home. Skinny little women like you shouldn’t be out on a night like this." My mouth hung open a bit, and he shut my door and walked off to his truck. That was also when i learned that in a Dirt Storm in the West, you never ever open your mouth unless you have something important that must be said. And you certainly don’t just let it hang open for no good reason at all. It gets dirty, so shut it already. So. Blue Northers are rare, Dirt Storms are not. But the mystery of how the temperature was just going to drop instantly was solved. It involved, of course, wind. And a lot of it. The Cowboy, wranglers, and grilled salmon with a best friend i wish I still knew…? Just extras. 1 explaining to a psychiatrist’s secretary why i will NEVER return to see her boss, and also try to project a calm confidence and nothing that appears like MomCrazy. 2 opening fridge, seeing the brightly colored sticker on the side of my kids’ pink prescription antiobiotic – and the words "SHAKE WELL"
3 getting a Diet Coke while still carrying on conversation with secretary who doesn’t understand why "I don’t think we’re a ‘good match’ " – what, like this is eHarmony? 5 spraying the entire kitchen and myself with fizz and laughing my head off while i gasp, abandon all attempts at ‘calm’ and ‘confident’ and giggle, "YO MY GOSH, it’s not a good time! OR a good match! heeee hEEEeee Thankyousomuchforcalling, bye now Heeeeee!" All of the above equals (at least the appearance of) MomCrazy, and then some. YEA to all of you who participated, and have that ‘woo, I’m such a responsible WOMAN’ kinda feeling. Sort of like after you vote, huh? Or exercise. It’s great to be proactive and YEA to ye who did so, especially all the ‘first timers.’ ahhh. that just warms my heart to see those words. Congratulations, Kim! Prize will be mailed soon! Sooo busy! And I know I said I’d draw for a winning BSE-er last night, and I didn’t. Some of you only read blogs M-F during work hours (gasp, shock and naivete, gasp) and I didn’t want y’all to miss out. See you tonight, when i really WILL draw for a winning BSE-er! From the comment section: KD (and myself) urge you all to please remember those mammograms! Also from the comment section: Technical support on installing your new, so cute, so deserved blog button: Courtesy of Julie, click here! *in case you’re impressed, don’t be. I get Ann Taylor bargains on eBay just by taking advantage of the sellers who misspell it "Anne." There are eBay prices, and then there’s "Misspelled on eBay prices" – even better! I enjoy a good shopping challenge, yaknow. It’s that time again! We get together on the 17th and applaud our health consciousness and I get to feel all proud of you who participate. Everyone please do your BSE, and then say you did it in the comment section of THIS post. I will draw a winner from those commenters on Sunday night. Notice: no blog required, just a name or an alias and a valid email only i will see. Then once you have participated only once, you are eligible for this beautifully designed Club 17 button from Desert Diva! Once you’ve done a BSE SIX times, you get the one with the crown, like in my sidebar over there on the left. Highlighting IBC awareness this month. Don’t know what that is? THEN YOU MUST FIND OUT. MUST. Start here. And then go here. And yes, really, do yourself a very QUICK favor and go here too. You need to know that the most aggressive, fastest growing form of breast cancer doesn’t involve a lump, and isn’t detected with mammograms. So yes, do the BSE by all means, but educate yourself on this other form of breast cancer too, please! My mom says I should tell you that women are finding lumps, seeing doctors, and following through on health issues as a result of this ‘club.’ And yes. I know. My mom also says that if you want to appear taller, walk a short dog. But that’s when she’s being funny, and this is when she’s being all mommish. updated: I forgot to tell you what I’m giving away this month! Oh well. It’ll be GOOD, but I"m still not tellin’. Ha! i love my dog. correction: i love MIKE’s dog. He’s a hunting dog named Duke, and Mike fell in love with him online. He was trained in South Dakota, and we had to go pick him up in Dallas. 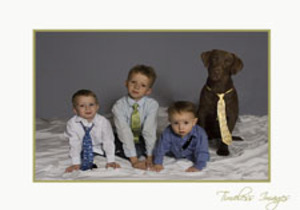 Yea to Shalee for guessing Chocolate Lab! No prize for the win, but if y’all are prize motivated come back tomorrow! And because I DO love Duke, I’ve become a fan of Cesar Millan, the Dog Whisperer. Love him! In his Valentine’s email to me (the love is mutual) he mentioned a search engine entitled GoodSearch. You can enter who you would like them to GIVE money to, and then search just as you would on google or anywhere else. When I searched yesterday, Cesar’s foundation had just over $50. Today it’s at almost $100! That’s adding up pretty quickly, huh? If you’re a Cesar fan, just type in Cesar and Ilusion Millan Foundation, and click verify. If you’re passionate for another cause, or school, or charity – check to see if they’re signed up with GoodSearch or encourage them to sign up! HolyAuntie is all about the horses, remember? I’m sure there’s a horse charity that could use a few searches that generate some dollars. So tell me, y’all… what organization would you like to benefit with a few mouse clicks? I have SOOO enjoyed reading your comments on the last post. If y’all have more, keep it up. Muley? FanTAStic. Here things are crazy. The house looks like a Three Boy Tornado ripped through it several times over, which of course is true. Two boys are sick (one went to the ER in the middle of the night because he couldn’t breathe. kinda important, yaknow. ), and one is making up for the other two with extra daring and innovative ways to fly off the furniture. The living room floor is littered with clothes, toys (because really, now, ALL the toys must be spread evenly across any surface), and even the numerous couch cushions went all "RUN FOR YOUR LIVES!" and apparently leapt from their normal places. Two parties were missed (one Valentines, one birthday), loads of sleep lost all the way around, and my job has been to snuggle two sick boys and one healthy, wiggly boy. I’ve got it pretty good. I think they’re going to be fine. The house – particularly the living room floor? well. that’s another story. jeana, jan, and yellowmama (Real Life friend long before we had blogs) no guessing. "To give the illusion of added height, walk a short dog." Isn’t she wonderfully odd? No. she doesn’t have a dog. Yes she’s short, but doesn’t ever seem overly concerned about it, either. Just J-Mom randomness. It got me thinking… what about "To appear shorter, walk a tall dog." Does that work? And how about "To appear thinner, walk a fat dog?" (if done repeatedly, i think that one might work, actually.) "To appear truly odd, walk a cat?" I bet y’all could come up with some J-Mom style tips. Share them in comments, please? what a wonderful day! the windows are open and the fresh, cool air is coming in. The littlest kids are napping, the bigger one happily playing a game. Really Great Husband (who took me on a so-nice date last night) is working in the garage, and even organizing it. (!!) the cat is purring. the birds outside are singing, and i can hear them due to the open windows… it’s a bit Disney. except that i haven’t had a shower and i really need to in order to fit into this picture… but even that’s good, because if i go now, i can clean myself without a small child, tub-side, pointing and making comments on the ‘view’. what a lovely, lovely day!